Cannabis Control - Take Advantage! 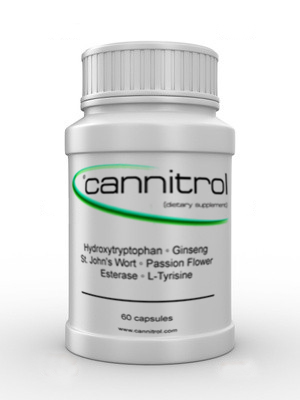 Cannitrol is a blend containing 5-HTP, Eleutherococcus Senticosus PE, L-Tyrosine, Valerian Root and St. John's Wort. This combination can reduce anxiety and improve alertness, control, and mood. As any marijuana user knows, naturally occurring compounds can be quite effective. We do not promote nor condone the use of marijuana but are simply offering a helping hand to individuals who want to control their use. Whether you're quitting for good, stopping for a few months, or just attempting a "tolerance break," Cannitrol can help you get over the hump!